Welcome to the Inky Antics Spring HoneyPOP Blog hop, if you have arrived here from Tex's Blog you are in the right place, if not you might want to start back at the Inky Blog so you don't miss anything along the way..
Today I am sharing two creations with you, using the absolutely ADORABLE NEW Honey Pop Set, Balloon Buddies (11086MC) I just love this adorable set!!! The first creation I would like to share with you is the card I made without the honeycomb papers. Hope you enjoy!!! Aren't these basket buddies soooo cute????? I decided to add some twine to the rope part of the stamped image to make it POP!! For my next creation, I used this same set, but I also used the AWESOME Rainbow Honey Comb Papers...eeek love this multi colored set of honey combs!!! Hope you enjoy what I came up with!!! 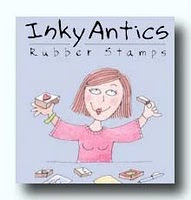 For my images, I used Prisma Pencils, stumps, and gamsol...Inky Antics sells it all come check it out!!!! The Blog hop starts today and ends on Sunday February 27th, at Midnight Central Time.... The more blogs you comment on the better a chance you will have to win an AWESOME prize!!! Two people’s names will be drawn at random to receive a surprise Inky HoneyPOP prize pack. The winners’ names will be announced on the Inky Antics Blog next Monday, so remember to stop back and see if you’ve won. This is adorable and so creative. Just love it. great cards! I love all your detail. Your cards are just too cute! Both of these are fantastic, but I especially love the twine on the first card and all your layered deatils. Wow, it's just awesome, Crystal! That's some cute Honey Pop! I love your cards they are so cute and fun! I just bought the rainbow pad last week just so I could do a hot air balloon card with it. So cute! wow, love the dimention your cards have- even before the honey pop!!! Beautiful cards. Love the colors and details. Thanks for sharing. Crystal these turned out so cute-love the whole scene and you always have such an eye for all the details. These are SO stinking cute!!!!! I LOVE how you did the Balloon on the Kraft! YUMMY@!!!! Love, love, love your cards! I've got to have some of the new mulit colored paper! Oh what darling creations, Crystal! Suddenly my stamp 'need' list just grew longer, thanks to these! These are adorable, love all the little details you added to each card and the hot air balloon is so fun with the new rainbow honeycomb paper. two great cards Crystal! love these sweet animals! Fun and fabulous, Crystal!! I love these cute animals!! oh Crystal, these are totally adorable!!! 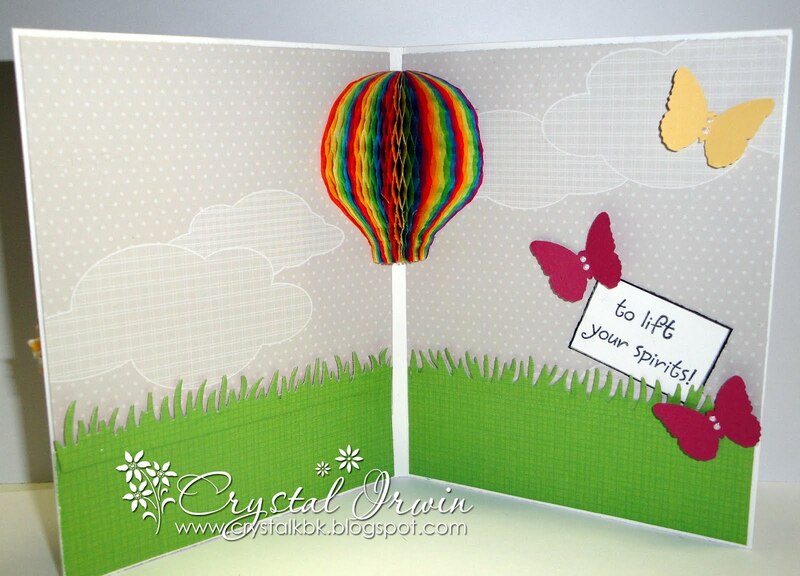 love the balloons, inside & outside and your twine flower,too fun! So cute! I love the rainbow balloon inside. Very cute cards....I do love the basket buddies! Thansk for sharing! WoW, these are just fabulous, Crystal! LOVE that honeycomb paper ... I NEED some, LOLOL! omg! the inside of that card is awesome. how do you do that???? both cards are absolutely fabulous. LOVE the stitching on the first one. i envy anyone who can use a sewing machine. they hate me (the machines that is). but i CAN do hand sewing! Such sweet cards. Thanks for sharing. 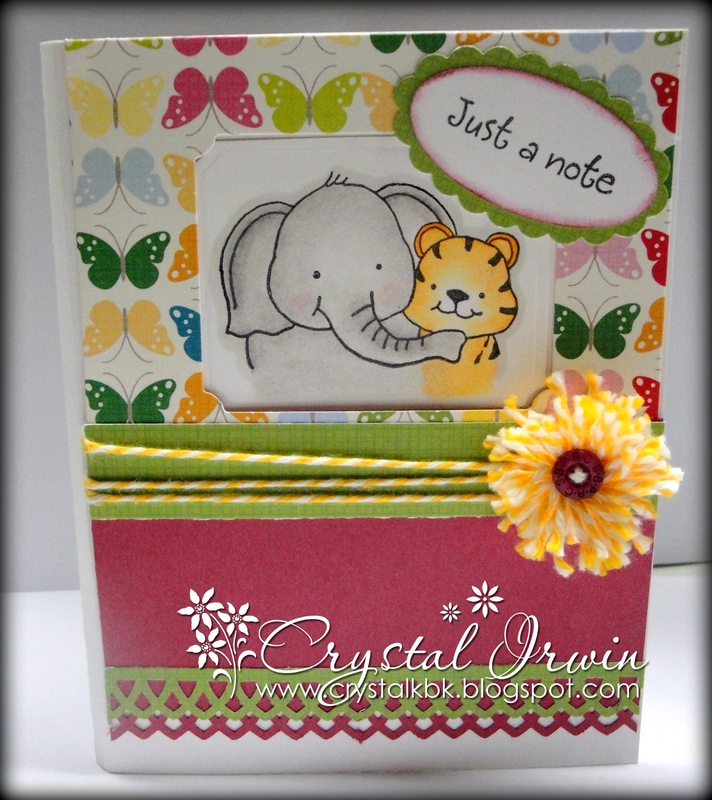 So adorable Crystal, gorgeous cute cards...fab colours so bright and fun.. 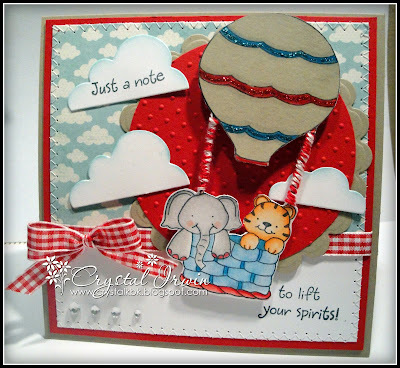 This creations art look on the paper art look so fabulous.I really like this cards cartoons art.I really inspire from this blog. What cheerful cards! The hot air balloon is so fun and the honeycomb balloon is so pretty and colourful. It is fun to have a surprise inside a card. Oh my ... how adorable! Great cards! This is utterly fantastic, Crystal! 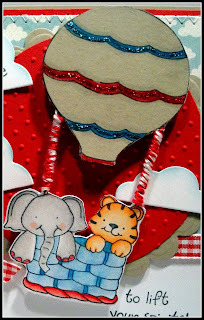 Love the cuties in the hot air balloon. The inside of your card is amazing. 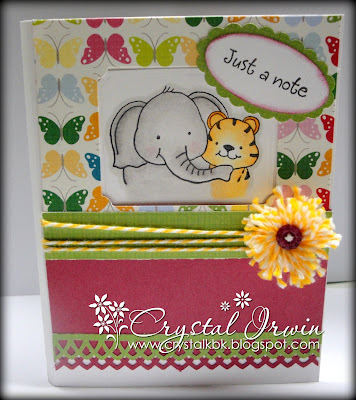 Gorgeous cards Crystal,love your colouring and designs, the image is so cute. dorable...and eally like that new paper!!! Great cards!!! Fabulous cards, Crystal!!!!! The little hot air balloon on the first card is absolutely adorable...love how you used the twine!!! The second card is soooo cute with the sweet image and what a fun surprise on the inside!!! Wow! Truly amazing and so creative! Oh my goodness Crystal these are both adorable!!!! Love these fun new images and the honey comb is so fabulous and fun!!! Great samples hun! Adorable cards. Love the surprise of the multi-colored balloon inside. These are both so adorable, Crystal! I love your balloon card! How very cute are THESE! You really did a great job with these images and the honey-pop on the inside of the card...just adorable. aww, these are too cute! OMGosh Crystal, these are SOOOOOOOO CUTE! Great images and I'm lovin your fab honeycomb too! Hey Crystal!! WOW!! These are both SOOOO fun!! Hope you had a fabulous wknd!! !